There are certain foods that I associate with events or periods of my life. My mother made the best peanut noodles and every year on my birthday I would request them. She had made-up the recipe herself and to this day it is one of my favorite foods. Since she has been gone for almost 7 years now I am sad to say that I haven't made the recipe in years. Every year on my birthday I tell myself that I am going to make them, and then I don't. I think it's a combination of things. Cooking her dish without her just isn't the same and I now associate the food so much with my birthday that I savor the memory as much as the food. I do this a lot with foods. The memory associated with the food is oftentimes as strong if not stronger than the food itself. Now that I have my own kids I hope that I am making memories with my two boys that they will associate with me. We cook frequently together. I find the memories of cooking with my mother some of the best food memories I have. My food memories aren't just isolated to my mother however. I always associate eating oysters on the half shell with my father. I took him on a number of trips and we always ate at seafood restaurants. He would never order anything that he thought was too much money (I paid for everything on the trips). However, one time I insisted he order oysters and he loved them. He still talks about the oysters and the trip as if they are intertwined in his collective memory. I also smile since they are a vivid part of my memory as well. Hopefully my kids will have similar shared food memories with me. Now that I have remembered why I love food so much, on to the recipe. Yesterday I tried a new recipe for Pork Loin with Cherries from the January issue of All You magazine. This recipe has 8 ingredients. It takes 4 hours and 25 minutes of total time, 15 minutes of which is active and makes 8 servings. I did make a few modifications to the recipe. Since it is the time of the year when Christmas foods go on clearance, instead of cherry juice I used the sparkling cherry juice I found on closeout. The sparkling juice in addition to cherry juice also had pear and apple juice which made a nice fruity taste to the sauce. I have never been able to find a 3 1/2 pound pork loin in my area so I bought a 6 pound roast and cut it to the right size. The recipe states not to use sour cherry preserves. However, the only preserves I was able to find used tart cherries so I used it and it worked very well. Make sure to adequately brown the pork before placing it in the crock-pot. I really does keep in the juices and creates a tender roast. I followed the remainder of the recipe as written. When the pork loin came out of the crock-pot I was worried. It looked almost like boiled pork loin and I was worried that the taste would be mediocre. I was very pleasantly surprised by what a difference the cherry sauce made. The cherry sauce was delicious and made the entire dish. It was so good that my four-year-old thought that I should make him a peanut butter sandwich with the cherry sauce. I didn't make the sandwich, but I did have seconds of the sauce over mashed potatoes. The sauce really is the star of the recipe. 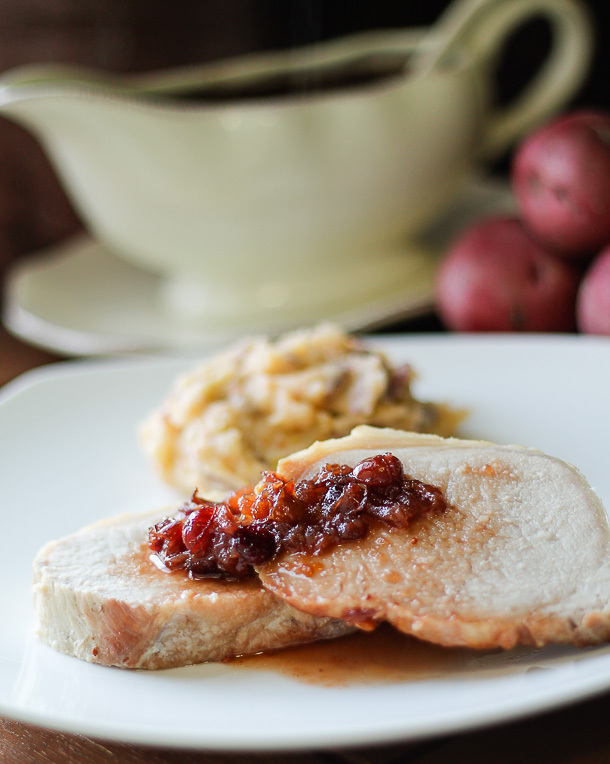 For the recipe go to Pork Loin with Cherries. I got a slow cooker for Christmas, so we'll try this! I love my slow cooker :) If you end up trying the recipe tell me how it turns out! I also associate certain foods with events. I love my crock pot - especially on those days when we have after school activities, so I'll add this to the list of things to try!